The first bit of advice when it comes to PA hire, will be to get a reliable provider, with a proven track record, who won’t let you down on the day. Whatever the occasion, above all you will want your event to run smoothly. You can assist the PA provider to give you a reliable service by making sure that they are given adequate information and reasonable access and space as well as enough time to assemble and test the equipment before it’s use. Informing the provider of the venue’s postcode can save you time in giving detailed directions. Selecting a suitable PA system depends largely on the size and capacity of the venue. For a smaller venue, less than 100 capacity) you might just require a simple Vocal PA of around 500w. A typical system is likely to include vocal microphones, full-range speakers, stereo power amp (unless the speakers are powered) and a mixer. Monitors (or foldback) is recommended for singers to hear the vocals. A good system is likely to have a graphic equalizer for FOH (Front of House, the sound that the audience hears) and another for Foldback monitors (what the band hears). Venues larger than this will generally require the backline (bass, drums and guitars) to be amplified by the PA as well as vocals. This will mean the addition of bass speakers to the full range speakers. Additional amplifiers and crossovers (which separate the low and high frequencies) will also be needed, as well as drum and instrument microphones and DI boxes (which convert unbalanced jack leads to balanced cables, often for sending the audio signals from a stagebox, along a multicore to the mixer). The mixer will need extra channels and is likely to be placed halfway down the hall so the engineer can get a good idea of the sound from the audience point of view. It’s helpful to the PA provider if you give details of performers and their instruments (lineup), number of vocal mics needed. If the backline is to amplified by the PA, specify whether guitar amplifiers will need mics or DI’s, and drum requirements as well as internal pickups in other instruments. For large concerts and events, a PA ‘Rider’ is specified, this is a detailed list of requirements from equipment needed and monitor locations on stage right down to the singers favourite drink. 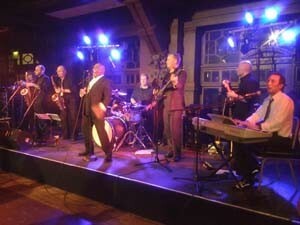 As with small bands, selecting a suitable PA system depends largely on the size and capacity of the venue. A solo singer/guitarist might just require a simple Vocal PA of around 500w, to include vocal microphone, full-range speakers, stereo power amp (unless the speakers are powered) and a mixer with effects. Unless the venue is very small, a monitor (or foldback) is recommended to hear the vocals. A good system is likely to have a graphic equalizer for FOH (Front of House, the sound that the audience hears) and another for Foldback monitors (what the band hears). A PA system at a wedding can be used for announcements and speeches and also as your own personal disco for playing your favourite music. If you wish to play your own selection of tunes with a portable ipod, laptop, tablet, CD, DVD, Cassette, phone or other player, it can easily be connected to the PA system. 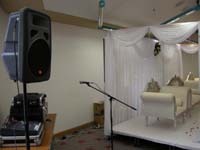 DJ’s or groups will often provide their own sound system, but often don’t have the necessary time and equipment so are happy to have a sound system provided by a PA Hire company. Whatever your device, DJ controller, laptop, phone, tablet, ipod, CD, DVD or mini disk player, it can be connected to a PA system using phono leads or stereo mini jack. It is best to specify the output connector type of your device to the PA supplier to make sure the appropriate leads are supplied. Dance music will usually require additional bass speakers which help accentuate the drum and bass beat. Smaller venues (up to 250 capacity) need over 1000w (1k) whilst larger halls might need 2k or more. A monitor speaker might be helpful to the DJ if the main speakers are a distance away from the DJ operating position. Deciding what system you need will generally depend on the size of the venue and size of audience. A small venue with up to 200 capacity might just require a 500w system with pair of speakers, amplifier and graphic equaliser, whilst a large long hall with thousands of people in the audience might need several more speakers at intervals along the length of the hall with a built in delay system. As with announcement systems, this will very much depend on the size of the venue, the number of people expected to attend, and whether those talking will be standing and talking directly into microphones, possibly at a lectern, or seated at or around a table, in which case boundary or gooseneck condenser microphones can be placed on the table tops. Projectors and tripod screens, or plasma / led screens are likely to be useful for presentations. If mains power is not available from close proximity, outdoor events will require the hire of a generator, although battery based systems will often suffice for simple announcement or background music systems, meaning far less noise than a petrol or diesel fuelled generator. Tannoy horn based 100v line systems are suitable for covering large areas at announcement events, bear in mind that music played through these systems is not likely to reach perfect audio quality. Lighting will be a consideration if the event is to run on into the evening. For pop festivals, concerts and outdoor musical events, in which performers are playing from a stage area, speaker stack systems are usually placed each side of the stage facing the audience, whilst monitor speakers are placed on and around the stage area for performers to hear themselves. The mixing desk will, with the help of a multicore, be placed at a good enough distance away into the audience so that the engineer will be able to have a good enough assessment of the sound from the crowds point of view. At very large events, a separate mixer and engineer can be used to control the monitor stage sound for the performers. The size of a PA for this type of event will range from a 2k (2000w) rig with engineer and crew for a few hundred people, up to a 20k (20,000w) rig or more with several engineers, stage manager, stage riggers, security and many other crew for an event in which many thousands are expected to attend. Whatever the size of the event you are planning, it is very important to take advice from experienced providers and encourage them to communicate with each other in a co-operative way for a successful event.